Hi, I am interested in your 1958 Ford Thunderbird listed on Autotrader for $48,750. I'd like to get more information about this vehicle and confirm its availability. This very unique Thunderbird offered here represents a one-off example that was the recipient of an exacting restoration in 2004 that converted the 25,000 mile original (now 28,427 miles) coupe into a full-fledged convertible utilizing all Ford parts! Amazingly, this example displays the workmanship and quality of a custom coach built motor car and is undoubtedly the only example of its kind to retain a perfectly fit hard top as well. The engineering and craftsmanship is nothing short of remarkable and is more thought out in both its conception and application than almost anything built in Detroit at the time. 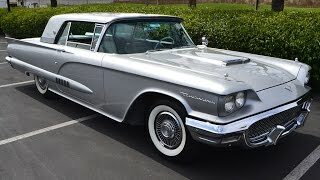 When we first laid eyes on this T-bird, we thought for sure that it was a factory hard top Convertible, but we scratched our heads wondering why Ford would build such a car? Then after doing some research, we discovered what it really was and we were amazed at the workmanship! You would never guess it wasn't a factory built Ford concept car! It comes complete with a host of power amenities including windows, steering and driver’s seat. The engine bay appears very well restored and the power convertible top is beautifully hidden within the rear deck in a nicely lined and trimmed compartment. The car is in very nice condition overall, but it has been driven over the years and has acquired some patina on the paint and interior. Here is a rare opportunity to own this beautiful, one-off example.